Twenty years after Gordon Sturrock and the late Perry Else’s Colorado Paper introduced the Play Cycle, it now underpins professional playwork practice, training and education. 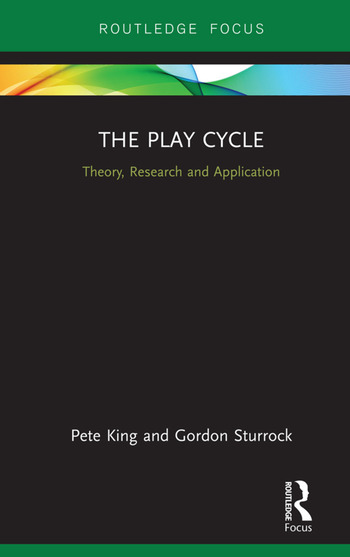 The Play Cycle: Theory, Research and Application is the first book of its kind to explain the theoretical concept of the Play Cycle, supported by recent research, and how it can be used as an observational method for anybody who work with children in a play context. The book investigates the understandings of the Play Cycle within the playwork field over the last 20 years, and its future application. It addresses each aspect of the Play Cycle (Metalude, Play Cue, Play Returns, Play Frame, Loop and Flow and Annihilation) and combines the theoretical aspect of the Play Cycle with empirical research evidence. The book also provides an observational tool for people to observe and record play cycles. This book will appeal to playworkers, teachers, play therapists and professionals working in other contexts with children such as hospitals and prisons. It will support practitioners and students in learning about play and provide lecturers and trainers with a new innovative teaching and training aide. The art of 'message analysis'. Pete King has a PhD in Childhood Studies and is currently a Senior Lecturer at Swansea University, UK. Gordon Sturrock, along with late Professor Perry Else, co-founded the Ludemos Associates,UK.